Since the beginning of his term, President Obama spoke about the need to build bridges of understanding with the Islamic community. He voiced repeatedly that Islamic extremists are not representative of Islam or the majority of Muslims in the U.S. and around the world. From his address in Cairo in 2009 to his final State of the Union, President Obama repeated these statements and yet they did not seem to build the greater understanding he called for. Meanwhile, blunt generalizations about Muslims and Islamic extremists have been part of the political discourse in the 2016 election season. Politicians have vowed to prevent Muslim refugees from coming into their states or into the country. In the wake of the Paris and San Bernardino attacks, there has been an increase in incidents against Muslims happening across the U.S., including a Sikh man wearing a Turban who was barred from boarding an airplane into the U.S. and a young girl whose hijab was torn off her head by three older classmates in her New York middle school. And all of this has contributed to the extremists’ rhetoric being legitimized by their enemies and moderate Muslims being persuaded towards extremist groups. President Obama needed to change the narrative of Muslims and Americans being at war with or in opposition to each other. He needed to do something different to ensure that Muslim Americans knew that the U.S. government does not condone the hateful rhetoric against Muslims and is committed to promoting the greater understanding that needs to happen between Muslims and non-Muslims in the U.S. He needed to connect with Muslim Americans on their terms if he hoped to persuasive. And so he did something he had not yet done as president: he visited a U.S. mosque. President Obama went to the Islamic Society of Baltimore on February 3, 2016, the first time this president visited a U.S. mosque while in office. He spoke to prominent Muslim American religious and community leaders, government leaders, and members of the community. And in a 45-minute long televised address, President Obama spoke to the Muslim community in the United States, as well the larger American public. In this address, President Obama skillfully practiced the principle of connecting with your audience its terms. Here is a breakdown how he did this. He began by speaking about the Islamic Society of Baltimore and what this mosque does for the community it serves. “This mosque, like so many in our country, is an all-American story,” he said. President Obama’s statement was an important act of recognition that Muslim American community has been seen, heard, and appreciated by the leader of their country. He continued by recognizing the concerns of the Muslim American community – the rise of terrorism in the U.S. and the world and the way in which this terrorism has caused a wave of hateful and discriminatory words and actions towards Muslims in the US. Back then, Muslims were often called Mahometans. And Thomas Jefferson explained that the Virginia Statute for Religious Freedom he wrote was designed to protect all faiths – and I’m quoting Thomas Jefferson now – “the Jew and the Gentile, the Christian and the Mahometan. He then acknowledged the reality that there is a very small fraction of Muslims that pervert Islam to justify terror, the divisive narrative of the West versus Islam that extremists propagate, and how this narrative affects the larger Muslim community. 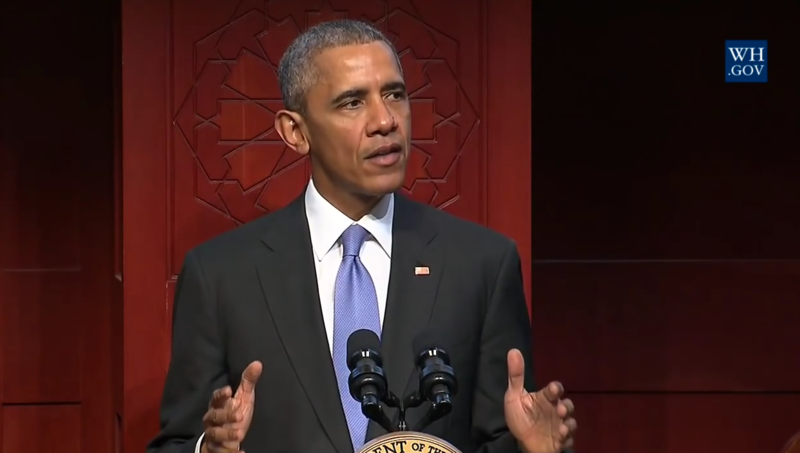 President Obama not only spoke in a language of faith by quoting the Koran, but also highlighted the shared history and values between Muslims and non-Muslims. He then spoke about times that the American people have fallen short of these values, using himself as an example. From when he first ran for office, President Obama has been attacked as being a Muslim, when in fact he is a Christian. He noted that Thomas Jefferson’s opponents also said he was a Muslim. He remarked, “I’m in good company.” He also spoke about other leaders and groups who faced similar suspicion because of their faith. [W]e have to understand an attack on one faith is an attack on all our faiths. And when any religious group is targeted, we all have a responsibility to speak up. And we have to reject a politics that seeks to manipulate prejudice or bias, and targets people because of religion…. None of us can be silent. We can’t be bystanders to bigotry. And together, we’ve got to show that America truly protects all faiths. He framed his call to stop attacks and discrimination against Muslims, whether it be words or actions, as not only un-Christian, but also un-American. He then called on Muslim Americans as well to play a bigger role in the “battle of hearts and minds” by lifting up their stories and show what it means to be a faithful Muslim in a pluralistic society. 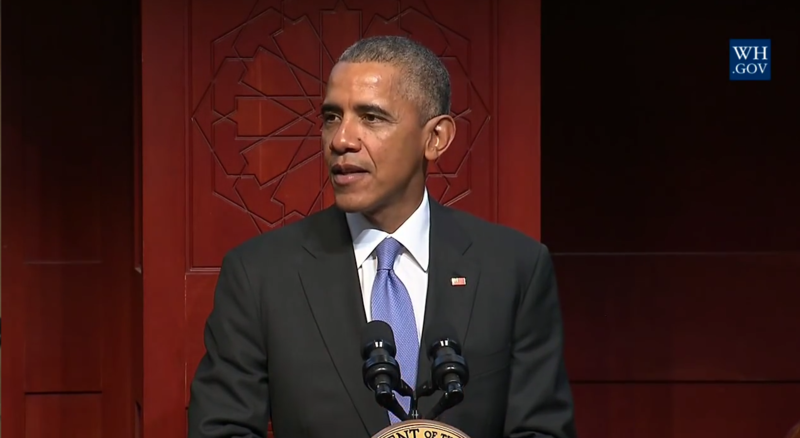 He then pledged, “[A]s Muslim communities stand up for the future that you believe in…America will be your partner. We will – I will – do everything in I can to lift up the multiplicity of voices that promote pluralism and peace.” This was a powerful pledge of support from the president to take on this work, which he followed up with specific ways he would support Muslim Americans. In our lives, we all have many identities. We are sons and daughters, and brothers and sisters. We’re classmates; Cub Scout troop members. We’re followers of our faith. We’re citizens of our country. And today, there are voices in this world, particularly over the Internet, who are constantly claiming that you have to choose between your identities – as a Muslim, for example, or an American. Do not believe them. If you’re ever wondering whether you fit in here, let me say it as clearly as I can, as President of the United States: You fit in here – right here. You’re right where you belong. You’re part of America, too. You’re not Muslim or American. You’re Muslim and American. You are not Muslim or American; you are Muslim and American. President Obama spoke directly to those people who were feeling the weight of the hateful rhetoric against Muslims and could be radicalized because of it. He said from his position as president that these young Muslim Americans belong in this country like every other American citizen. This was not a policy address. This speech did not propose some new legislation against discrimination, or call for Congress to pass a law on these issues. Rather, this speech was part of the battle for hearts and minds. Specifically, the battle to win the hearts and minds of Muslim Americans who were feeling targeted, and unprotected and unsupported by their government. It will be some time before we really know how well President’s Obama speech resonated with the Muslim American community, whether or not it won the hearts and minds it needed to. But President Obama’s speech masterfully embodied the principle of connecting to the audience on its terms. 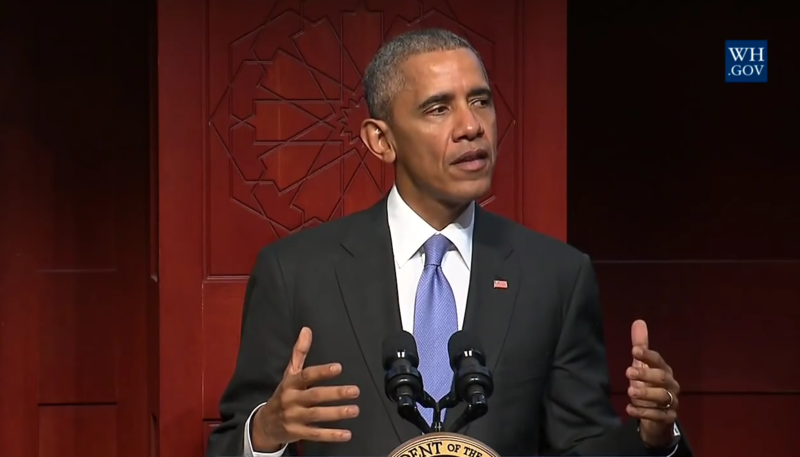 President Obama did not merely speak in support of Muslim Americans, as he had done before. Instead, he met them where they were by going to a mosque. He demonstrated that he heard their concerns. He recognized their work and their voices. He spoke to them in the language of their faith. He showed them and their faith respect. 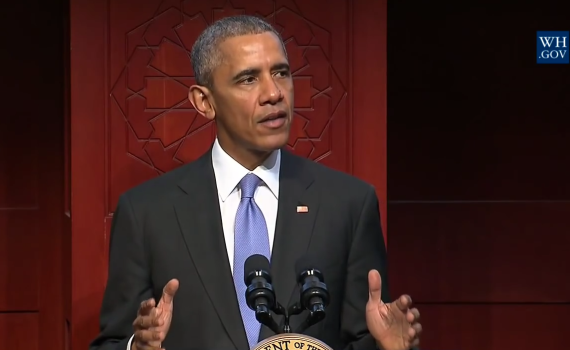 He highlighted the shared values and history between Muslim and non-Muslim Americans. He reinforced the American values of freedom of religion and equality under the law. He presented a counter narrative to the hateful rhetoric about Muslims. And he pledged to continue to support Muslim Americans. As for the larger American public, a secondary audience of his address, if President Obama was successful then perhaps we will begin to see his counter narrative take hold: That Muslim and non-Muslim Americans will rise and fall together, united by our shared values and called by our American ideal, as one American family. This blog is part of a series “Lessons in Communication from a Dancer,” which uses principles and skills of dance as a way to better understand the key principles of effective communication.